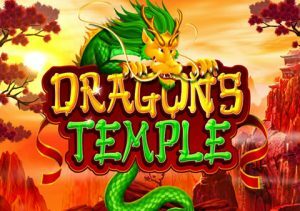 Take a virtual trip to China in Dragon’s Temple, a 5 reel 50 payline video slot powered by IGT. The chief selling point here is the bonus feature where you’ll have the pick of 5, 10 or 15 free spins with 1, 2 or 3 wild reels added. Helping things along in the base game are a selection of expanding wilds. It can be played from just 50p per spin across all devices. Dragon’s Temple is a fairly simple offering both in terms of looks and playability – overlooked by trees filled with pink blossom, the plain white reels include a selection of Chinese style vases, money wallets, fish and a temple which awards 500 coins if you land 5 on a single payline. Even more rewarding is the Dragon’s Temple logo which will get you a 1,000 coin payout for landing a 5 symbol combo. Rounding out the standard symbols are IGT’s usual lower value playing cards, this time from A to 10. The mighty dragon appears in 5 different colours, each of which is wild. As well as awarding payouts of up to 1,000 times your line bet, the wild can expand to fill the entire reel in which it appears to further boost your winning chances. This is known as the Expanding Full-Reel Wild feature. That’s pretty much it as far as features go – the 50 paylines keep the pace bobbing along in the base game but Dragon’s Temple really starts to sparkle once you’ve triggered the bonus feature. If we had to pick just 1 of the free spin / wild combos we’d go for the minimum spins with maximum wilds. It’s the riskiest option but can deliver spectacularly if the reels fall nicely. It’s not the most sophisticated video slot we’ve come across either in terms of design or features. It’s all perfectly serviceable though and the free spins feature has the potential to be a corker. The Chinese genre is a very popular one – Dragon’s Temple may not be earth shattering but IGT’s offering is worth a look thanks to the potential riches on offer from those wild reels. If you like wild reels in the free spins, WMS’ Black Knight II offers up to 3 sticky wild reels in a very high variance setting.